Debra is Senior Research Fellow working with Defence Science Technology Group and the Centre for Cultural Diversity and Wellbeing at Victoria University. She received her PhD in Political Science from Monash University for her exploration of the role of emotion within decisions to engage in violent political extremism. 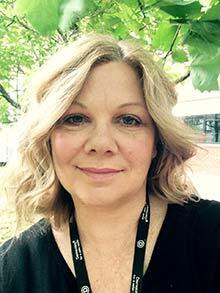 Debra’s research focuses on questions of violent political extremism, social conflict and social change. She has a particular interest in the role of emotion within violent extremism beliefs and action. Debra’s research has examined emotional investment in violent and non-violent extremist groups, the emotional resonance of violent and non-violent extremist messaging, and how emotions contribute to the development of moral positions that can justify violent acts. Debra has worked on projects with various law enforcement and government partners to understand processes of radicalisation that lead to violent political extremism. She is currently researching the area of social influence within the realm of social media and its relationship to violent extremism. Wright-Neville, D. and Smith, D. (2009), Political rage: Terrorism and the politics of emotion. Global Change, Peace & Security, Vol. 21(1), 85-98. Smith, D. (2016), Symbiotic othering: Terrorism, emotion and morality. In A. Eriksson (ed) Punishing the other: The social production of immorality revisited, Routledge. Smith, D (2017), ‘Flipping Social Influence: A Social Influence Model of Violent Extremism,’ Addressing the New Landscape of Terrorism Conference, Towards Formulating Actionable Responses, Alfred Deakin Institute for Citizenship and Globalisation, Deakin University, Australian Department of Foreign Affairs and Trade and National Broadcasting and Telecommunication Commission of Thailand (NBTC). Melbourne, 24-28 July, 2017. Smith, D. and Talbot, S. (2016), ‘Toward a conceptual framework for understanding social influence’, The Australian Sociological Association (TASA), Australian Catholic University, Fitzroy, Melbourne, 28 November – 1 December. Smith, D.(2016),‘#emotion: Youth, Social Media and ISIS’, VoxPol Network of Excellence, Dublin City University, June. Smith, D. (2016), ‘Beyond Doctrine: ISIS, Culture and Emotion’, Addressing the New Landscape of Terrorism Conference, Alfred Deakin Institute for Citizenship and Globalisation, Deakin University and Australian Department of Foreign Affairs and Trade, Melbourne, 17-19th February. Smith, D. (2015), 'Getting them in and getting them out: The importance of emotions in violent political extremism', Association of Southeast Asian Nations (ASEAN) Regional Forum, Kuala Lumpur 25-26 March. Grossman, M, Peucker, M., Smith, D. and H Dellal (2016) Stocktake Research Report: A systematic literature and selected Program review on social cohesion, community resilience and violent extremism, 2011-2015. Melbourne: Dept. of Premier and Cabinet, Victorian State Government. Barton, G., Barrelle, K., Smith, D., Smith, A. (2013), Building community resilience to violent extremism: Part 2 – countering violent extremism evaluation methodology. Monash University and Department Premier and Cabinet Public. Smith, D. (2009), Should the West engage with Hamas? Monash University Annual Vice-Chancellor's Public Debate, Talking in the affirmative with former Prime Minister, Malcolm Fraser and Public Advocate for Australians for Palestine, Michael Shaik. Debra currently co-supervises two PhD students. Smith, D. (CI) and Peucker, M (CI), (2017–2018), Networks and narratives of far-right movements in Victoria, Victorian Government: Social Cohesion Research Grants Program, $146,000. Smith, D. (Principal Investigator) (2015-2018), Understanding the relationship between online and offline social influence in radicalisation leading to violent extremism, Industry Postdoctoral Research Fellowship, Victoria University and Defence Science Technology Group, $440,000. Grossman M., Peucker, M. and Smith D. (Co-Investigator) together with Hass Dellal (Australian Multicultural Foundation) (2015-2016), Stocktake research project, commissioned by the Social Cohesion and Community Resilience Ministerial Taskforce, Department of Premier and Cabinet, Victoria, $49,000. Currently the Principal Investigator working with DST Group of the project, Understanding the relationship between online and offline social influence in radicalisation leading to violent extremism (2015-2018). Currently working with RADAR Solutions to facilitate and deliver training for practitioners in the use of National Countering Violent Extremism Intervention Tools and to deliver the Countering Violent Extremism Awareness Training for Senior School Leadership Teams. Smith, D (2017) Radicalisation in Australia, Radio Adelaide, 6 September. Peucker, M and Smith, D (2016), Anti-Muslim agenda in media and rallies drags discourse to the political right (external link), The Age, 13 June. Radical Rewire (2016), SBS The Feed, May 23. Smith, D. (2015), Game of seduction we need to battle, The Age, 24 March.